Exhibiting my work in Times Square "is a great honor , as well as a responsibility," said Zapata in an interview with Efe. The first six videos, as they will be changed over the two months that have the space reserved for their art, are shown every two minutes and contain positive messages for the 330,000 people who travel every day through Times Square, a must for the tourists who visit New York. According to him, with this video installation he also wants to pay a "tribute to Spanish culture". The artist reached an agreement with New Tradition Media , the company that owns the screens, to promote The Times Square Art Project , an artistic program that wants to make the streets of the city an art gallery . "Everything you see there is advertising and we think that we could include something artistic," said Zapata. The artist expressed his "pride" for having reached an agreement with the owners of the screens and the current owners of the building, Jamestown Properties and Sherwood Equities , to "share the art and make many people happy". The building obtains strong income for the advertising use of those screens; nevertheless, the owners considered that the project benefits the city. "It's not an economic issue, it 's an artistic issue . Thank God, there are people like them who believe we have to do it, "he said. 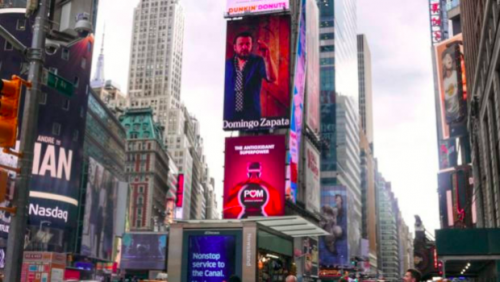 Domingo Zapata is the first artist to make such installations on these Times Square screens, although he is convinced that "others will come later". Among the first six videos is " Life Is a Dream ", Zapata winks at the classic Spanish author Pedro Calderón de la Barca (1600-1681) and his most famous theatrical work. « I Love Your Positive Energy» is the title of another of the videos, in two more Zapata is seen painting the city of New York and welcoming with the sign « Welcome to New York » and in the last two are seen painting one of their traditional bullfighters or « Bull Fighters ». His figures of bullfighters , he says, serve to highlight "the strength of that culture (the Spanish), something that other painters like Goya or Picasso have already done ," said the artist. Considered the Spanish Andy Warhol by the New York Postnewspaper , the Spaniard said that in May "three well-known personalities" of film, music and television who are also part of this artistic project will collaborate on their videos. " They will be three collaborations , where they will appear painting and showing some inspiring message," he revealed. This project "is something that begins now and that is not just for me. The important thing is that above all it is not reduced to something commercial . Sometimes we have to do things differently and with our hearts, "he said. Although he considers that New York for years has been one of the capitals of art , he admits that "everything is changing" and that "the center is nowhere". However, he notes that the city "remains a very important point of reference ", since "its streets are great museums that give rise to much inspiration". Domingo Zapata is also immersed in the preparation of an exhibition of paintings he has painted with the Spanish singer Alejandro Sanz , one of his closest friends. Both are scheduled to premiere this show in early May at the HG Contemporary gallery in the artistic district of Chelsea, in New York.